In preparation for the 2019 KHSAA State Bowling Championships (February 7-8), we wanted to remind you of the opportunities available for the student-athletes of Kentucky. 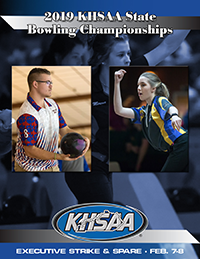 The KHSAA will continue to offer Unified and Adapted events to include regional and state bowling competitions. While most unified and/or adapted athletes have been participating throughout the season, it is important to review the following information prior to the start of the postseason. Unified partner athletes and special athletes must be listed on the Unified roster in the KHSAA database and each school needs to check the box for a Unified Team if they wish to compete in the regional and/or state competition. The bowling head coach or Athletic Director for each participating member school should enter Unified student-athletes on its postseason roster on the KHSAA database for Unified bowling. Postseason rosters for Unified bowling must be edited using the KHSAA online system roster by Monday, January 14th at midnight to allow time for schedule adjustments, trophy orders, etc. From that postseason roster, coaches can submit regional entries to the regional manager, via Form BW127, four (4) days prior to the regional tournament. A student-athlete must be listed on the roster in order to participate in the postseason. Form BW127 is an online form. A school may enter a maximum of 12 Unified pairs (one partner athlete, one special athlete). Adapted athletes will also need to be entered through BW127. Currently, there is not a roster system in the KHSAA database for adapted athletes, but coaches can enter athletes in the regional competition through BW127. BW127 will be utilized for entering unified, adapted, or ambulatory bowlers. Please use the link below to enter unified, adapted or ambulatory athletes. Do not use the regular BW110 to enter Unified and Adapted entrants. If your school has an ambulatory athlete or questions about Unified entrants, please contact Sarah Bridenbaugh (sbridenbaugh@khsaa.org) immediately to ensure your entry. We appreciate the cooperation of Athletic Directors and coaches in their attention to this matter. For information regarding entry into the traditional Team and Individual events, see the information at https://khsaa.org/011419-regional-bowling-entries/.